In an earlier review of Purrfectplay's products, I tested some amazing products with our cat Tony and puppy Harley. Since that review, Harley died of a heart attack. He was just over a year old. We all struggled with Harley's death, but no one in the family took it harder than my youngest son, Ian. You see, Harley was HIS puppy. In November, we decided that we would adopt a kitten from the shelter. We took both boys, but the decision on which kitten we brought home with us was ultimately Ian's. I saw an adorable caramel-colored long-haired female kitten I secretely hoped Ian would choose, but he didn't. Immediately, he went for the black and white short-hared male. He was older than most of them, which was a bonus. Ian played with the kitten for a little while, and then reached down to pick him up. Right away, the kitten took to Ian, even allowing him to hold him on his back while Ian rubbed his tummy. It was truly love at first sight for Ian, so the kitten, named Flip by Ian, came home with us. Pam from Purrfectplay (makers of organic, dye-free, natural fiber toys for pets. Dye-free organic fibers are naturally toxin-free. This is important to us. ) very generously sent Flip and Tony some toys to play with. 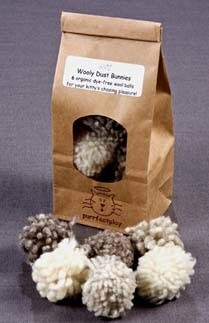 The Wooly Dust Bunnies have been a HUGE hit with Flip and Tony! They are the perfec t size for both kitties! (Flip is still small for 8 months, and Tony is a very large 5 year old Ragdoll.) I love watching them bat the balls with their paws and chase them all over the living room. Having hardwood floors really makes these balls go, so the cats are often zipping past us in chase. So many kitties love a really small chasing ball. These little "bunnies" are perfect for just this kind of play! We wrap organic dye-free wool into pompoms and felt them . Light weight and fuzzy, these little balls are super fun to chase across the floor. They can get lost so we sell them in half dozens. Each bag comes with 6 wooly dust bunnies, a little packet of catnip for encouragement, and a simple organic cotton washing bag. Machine wash and dry. Please don't let big dogs swallow them! Made in the USA (Indiana). If you have cats, you need to try these toys with them! They have provided countless hours of pure entertainment for out cats! Another simply fabulous toy Flip and Tony had the pleasure of testing is the Chubby Snake. This toy is FILLED with catnip. What cat doesn't like catnip? 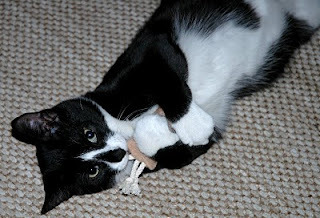 Seriously, when I first tested catnip toys from Purrfectplay with our cat Tony, I didn't think he would play with anything, regardless of the catnip. He has always been a sedentary cat, even as a kitten. So, imagine my surprise when the Purrfectplay catnip toys transformed him from a lazy cat to an extremely playful cat? The Chubby Snake is a great toy for cats who like to wrestle with their toys. Flip and Tony wrap their bodies around the Chubby Snake and kick at it. It is hilarious to watch! Flip will even cuddle up to the snake and sleep with it. At approximately 13 inches long by a chunky 7 inches wide, our new snake is a great alternative for those kitties who hug and kick their toys. This lovable toy is made with a soft but durable outer layer of fluffy thick organic Colorgrown fleece and tied with sturdy hemp cords. 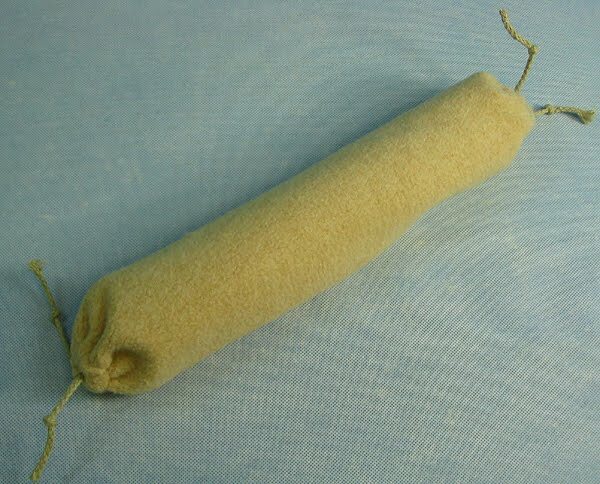 Inside you will find a separete organic cotton tube stuffed with our wonderful organic catnip and organic cotton batting. Hug it, kick it, wrestle with it, and sleep on it-- no matter how you play with it, it's great! Pam also sent Flip a Baby Happy Carrot to try. Tony tested the larger carrot last year, and it was quite amusing to se Flip react the same way as Tony did when he was first given the toy. Flip meowed and purred quite loud, and then he grabbed the carrot and rolled onto his back while he played with it. So cute! Some of us live with cats that love everything small. We now offer our popular Happy Carrot in a smaller version perfect for these kitties. Each baby carrot is just over 3 inches long and 1.5 inches wide. Handcrafted from exactly the same lovely organic dye free fleece, they are filled with our amazing certified organic catnip and topped with little hemp leaves. Ideal for chewing and tossing! We offer these baby carrots in clusters of three. Tied together and labeled with a tag we craft from repurposed kitty calendars, they make great gifts for your kitties or the kitties of those you love. I really like the toys from Purrfectplay. Not only are they safe for our cats, our cats absolutely love them! Purrfectplay is the purrfect solution for people who want safe, natural toys for their pets! It is definitely our new favorite place to shop. Cute picture! I absolutely love Purrfectplay and their toys! My animals are BIG fans of their toys!